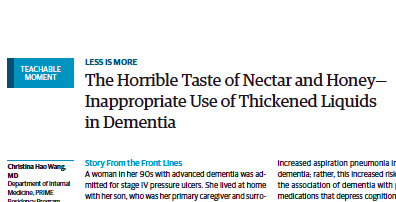 This week's JAMA IM includes a case of a woman in her 90s with advanced dementia who was started on honey-thickened liquids for aspiration prevention. She subsequently “refused nearly all food and thickened liquids, turning her head when nurses attempted one-on-one feeding” and was transitioned to inpatient hospice care. What happened next? Her diet was changed to regular liquids and she was allowed to eat her favorite foods. Two months late her weight improved with no clinically apparent aspirations. This is the story of thickened liquids. As the authors of the article, Drs Wang, Charlton, and Kohlwes, explain: “thickened liquids have become a part of routine care—some might even argue the standard of care. This has created the perception that thickened liquids are beneficial and safe for patients with dementia.” Unfortunately, the evidence base to back up its efficacy in dementia is poor and as in this case, places patients at significant risk of adverse effects. "The routine use of thickened liquids to prevent pneumonia in patients with dementia should be avoided, and diet should involve a comprehensive approach rather than a reflexive diet modification."